The Island Creek Oyster Bar partners—Chef Jeremy Sewall, Skip Bennett, Garrett Harker and Shore Gregory—spread the gospel of oyster culture to Burlington with the opening of their second Island Creek Oyster Bar location within The District. Mirroring its citified sister restaurant, ICOB Burlington continues its pursuit of placing seafood at the center of a collaboration joining farmer, chef and diner. Open for lunch and dinner service, Island Creek Oyster Bar remains market- and seafood-driven, providing a venue for fishermen and shellfish farmers from across the country to showcase their catch. The restaurant features a dynamic raw bar program that spans the North American coastlines and offers additional embellishments like dayboat lobsters, littlenecks and hand-harvested razor clams out of Duxbury Bay. 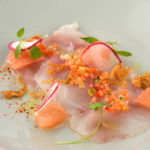 A daily selection of crudo and ceviche allows the kitchen the ability to play with flavors and techniques. Nationally-recognized Bar Director Jackson Cannon has created a beverage program that’s delicate, seasonal and playful. With an emphasis on sparkling cocktails, vermouth and house-made shrubs, the drink list accentuates and extends the seasons. Whimsical Tiki-inspired libations and swizzles round out the cocktails while a seafood-friendly wine list highlights organic, biodynamic and sustainable growers. A diverse (seasonally and regionally) beer list will satisfy the hops lovers. The space, which includes a 90-seat dining room, a 65-seat bar and lounge, a variety of private dining opportunities and a spacious 40-seat patio, captures the stunning natural attributes of Duxbury Bay and the Island Creek Oyster Farm. Reclaimed Wyoming snow fence was used to create the shutters; Jet Mist granite countertops provide the bar and drink rails; and Gabion cages filled with tens of thousands of cleaned oyster shells make up a massive, three-dimensional wall. Each of these elements, chosen deliberately for their unique and subtle traits, pull together a fitting tribute to this historic New England town. Throughout Matt Celeste’s career as a chef, he has been committed to both technique and local flavor. A native of Danvers, Mass., he grew up eating his Sicilian grandmother’s pasta, sauce, and meatballs. But it wasn’t until he took a cooking job in college, while he was studying computer science, that he discovered that his place was in the kitchen. After graduating from Wentworth Institute of Technology, Celeste turned squarely towards the act of cooking full-time, working at Boston institutions like Mistral, Au’jourdhui at the Four Seasons and Eastern Standard. Working alongside Executive Chef Jeremy Sewall, Celeste put all of his fine-dining knowledge to the test as he faced the all-day, all-night dining crowds that fill the Kenmore Square establishment. Though extreme, the work, professional atmosphere, and team environment prepared him to step up to the plate when Sewall asked him to be part of the opening team of Island Creek Oyster Bar next door. There, Celeste received a crash course in fish butchery and cooking as he helped execute a daily-changing menu. Stepping away from the Kenmore Square team to work at Posto in Somerville, Celeste later dove into the hands-on experience of making fresh pastas and pizzas; he eventually returned to a fine-dining establishment, working under Chef William Kovel at Catalyst Restaurant in Cambridge. All the while, the young chef was building up his skill set, learning how to juggle multiple facets of a running both a traditional kitchen and an event facility, and unknowingly preparing for his future role at the Island Creek Oyster Bar Burlington, the second outpost of ICOB, where he captains the culinary team as Chef de Cuisine, working alongside friend and mentor, Jeremy Sewall and Executive Chef Nicola Hobson. Outside of work, Celeste is inspired by foods of all stripes and colors, and feels most in his element eating Chinese takeout or a plate steak tartare. If it tastes good—like his Nana’s sauce always did—he’s motivated to recreate and refine it. Music and a good workout get him up in the morning—but it’s what he’ll cook and eat throughout the day that fuels is soul.